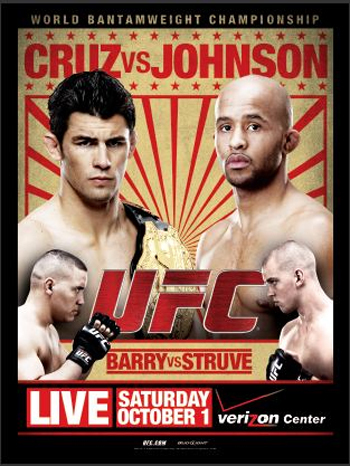 “UFC on Versus 6: Cruz vs. Johnson” takes place October 1st inside the Verizon Center in Washington, D.C. UFC Fight Club members have the opportunity to purchase seats for the show this morning at 10AM ET via UFCFightClub.com. A special Internet ticket pre-sale will be available to UFC Newsletter subscribers on Thursday, August 11th at 10AM ET. The general public will have access to the remains on Friday, August 12th at 10AM ET. The show features a bantamweight title tilt between champ Dominick Cruz and Demetrious Johnson and will be co-headlined by a heavyweight shootout with Stefan Struve and Pat Barry. Versus will broadcast the main bouts live starting at 9PM ET/6PM PT.